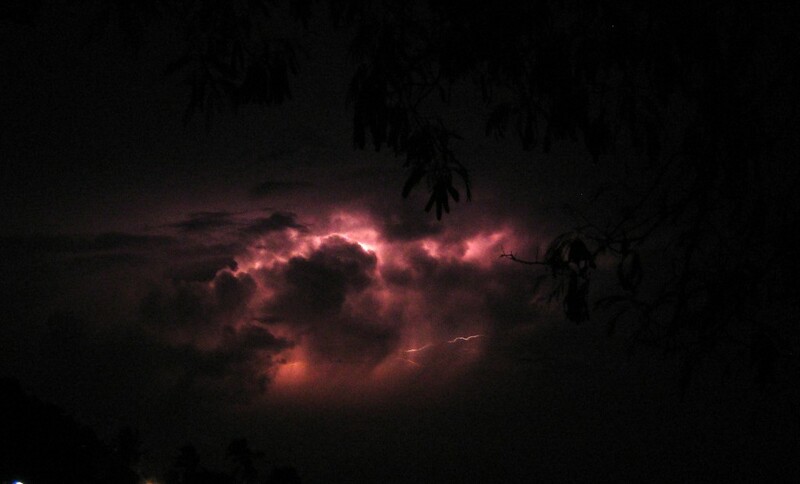 The lightning of Catatumbo flashes above Curacao. Photo by Mark Vermeij. Oscar sees the lightning every night. He watches its mile-high dance above the mouth of Venezuela’s Catatumbo River, seventy miles across the Caribbean Sea from his shack on the island of Curaçao. The sky ignites just after the sun sets, and it continues until sun-up, always above the same spot on the horizon. Lightning scientists, or fulminologists, believe that as cold winds roll seaward off the Andes they collide with warm, wet air climbing out of the decaying marshlands of Lake Maracaibo, the origin of the Catatumbo. The earthen drafts carry gases skyward, feeding the celestial fire like dry kindling. But the lightning neither crackles nor pops: it merely bounces from cloud to cloud, and radiates more natural electric luminescence than nearly any other place on earth. As I sit next to Oscar, I watch for lights in the water, the occasional glow of an underwater flashlight scanning the ocean bottom. Below the surface the two other members of my research team are on SCUBA, spying on mountainous star corals in anticipation of their annual mating dance—the synchronous release of eggs and sperm. It occurs but once a year and with an incredible degree of punctuality, necessary to perpetuate the species. These corals use the water temperature to pick the month, the moon cycle to choose the day, and the amount of time after sunset to define the moment. Based on the observations of other scientists, we can predict, down to a fifteen-minute window, when nearly every colony will simultaneously make their annual attempt to reproduce. Everything is quiet except for the drone of the desalination plant behind us. Pockets of steam billow from its smokestacks twenty-four hours a day, accompanied by a low hiss. The expansive system is a network of holding tanks, scaffolding, and piping, all with the singular purpose of stripping ions from the water, turning saltwater into fresh. The factory provides drinking water to the 200,000 residents of Curaçao and the millions of tourists that venture through the island every year. A year ago, drinking water had also brought Oscar and me together for the first time. I had arrived in the evening, along with my colleagues, Drs. Mark Vermeij and Kristen Marhaver, to a dirt parking lot between the water plant and the sea. Adjacent to the lot I spied a “snack”—the name for a local eating spot—by its telltale fluorescent lights. Couches and tables lined the covered porch and an exposed slab of concrete lay only feet from the water’s edge. The snack looked empty, though I could hear a television. “Bon nochi,” I said in Papiamentu to the old man that appeared. “Nochi,” he replied in the local language. “Do you have water?” I asked in English. I motioned with my hands to show him the large bottle that I envisioned purchasing. The man looked confused. The old man sauntered into a back room and returned holding a small beer stein and a two-liter Coke bottle filled with water and coated with condensation. He poured me a brimming glass. “This is good,” I said, holding up the glass. He smiled. “I’m Aaron,” I added. “Oscar,” he replied in a thick Caribbean accent. After thanking him I returned to the car where Mark and Kristen were fully suited for their sojourn into the sea: wetsuits, SCUBA gear, and tools of science affixed to their vests with carabiners. The costumes of underwater superheroes. They carried small plastic tents that they would gently place atop some of the coral colonies to sample eggs and sperm. Will the spawning of corals, like this mountainous star coral, be thwarted by bleaching? Photo by Kristen Marhaver. We’d come to the island to study how coral fare in the face of pollution from land and the warming of the seas. Does environmental change render adult corals less healthy? Does it make baby corals less healthy? 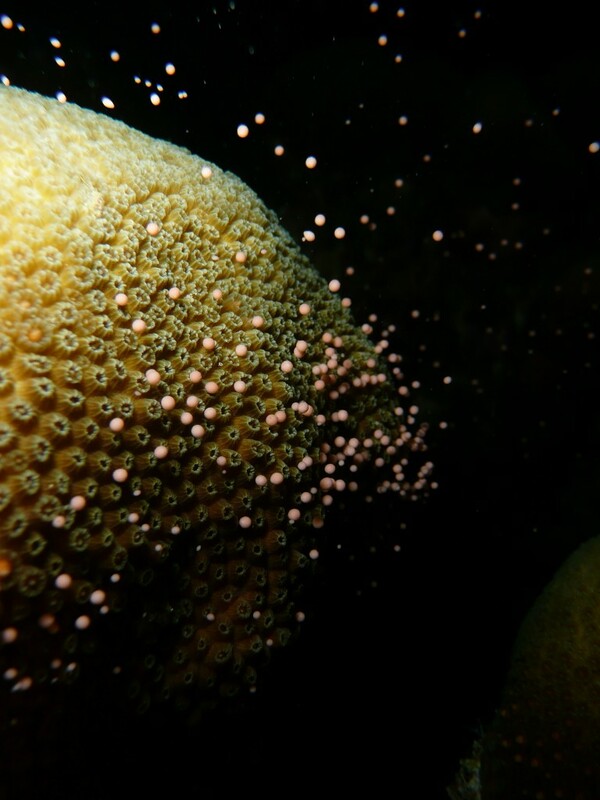 Are baby corals less healthy when their parents are less healthy? Answering those questions, we hoped, would bolster our understanding of the processes that may allow corals to rebound. “Watch feet,” Oscar exclaimed as we passed in front of his house, warning us about broken glass on the rocky shore. “Put shoes, put shoes,” he said as he shone a flashlight in front of us. After I helped Mark and Kristen into the darkened water, I went back to see Oscar. “You lock car, yeah?” Oscar asked as he craned his neck toward the parking lot, watching a group of kids hanging out near our vehicle. I nodded. “Good,” he said as I took up a wooden chair next to him. As I surveyed my surroundings it became evident that I was in a fisherman’s home. Spending time with my own grandfather had taught to appreciate silence in the presence of an elder, especially one versed in the patient art of fishing, so I chose to remain silent until Oscar spoke. After many minutes of silence Oscar ventured forth in broken English. I asked him about his house. “Thirty years I live. Dis good fisherman’s home,” he said resolutely. I grasped at his mention of fishing and asked him about the biggest fish he’d ever caught. “Right out dere,” he said, pointing directly offshore with his calloused fingers. He showed me with his hands that it had been well over a meter in length. “From a boat many years ago. Red mouth. Big eyes.” Oscar made rings with his fingers and placed them around his eyes, smiling. “It scare divers. It chase dem.” He chuckled at the thought and his eyes glinted. The marine biologist in me silently noted the timing of his conquest: a long time ago. As a profession we have watched as more and more fish have been taken from the sea. The fisheries scientist Daniel Pauly has coined the term ‘shifting baselines’ to describe a cultural forgetting of how our planet used to look. We as humans tend to believe that the natural world we see early in our life is pristine, and these observations define our perception of how we think the environment should look; in reality, of course, the environment of our childhood may already be severely degraded. With each new generation, we accept less. “Sure, just as many, man,” he replied. As Oscar tried to remember the name of the big fish he tilted his head back, clenched his jaw and closed his eyes. Just then the wind picked up, blowing up his shirt and billowing his tan capris, exposing his skin, dark and leathery. His 81-year-old frame stooped forward slightly, and his t-shirt hung loosely over his chest. His thin white mustache was well groomed, like his thinning hair, which was slicked back across his scalp to where it curled just above his neckline. Another fisherman, grey-haired himself, sauntered by, collecting small crabs from crevices in the rocks. He said hello to Oscar and gave me a nod. Together we studied the horizon, watching the lightning twinkle in the distance. Oscar wondered aloud whether a storm was coming. Fishing boats idle outside their owners’ homes. Many of Curacao’s fishermen are subsistence fishers who take to the seas to provide food for their families. Photo by Mark Vermeij. The lightning of Catatumbo is one of the largest sources of ozone on the planet. Fulminologists are unsure of the fate of the gas, and its impacts: It either ascends and replenishes the ozone layer or persists in the lower atmosphere and contributes to the greenhouse effect. The lightning can flash twenty thousand times in a single night, each lasting only a split second, and people say it generates enough energy to perpetually light every bulb in South America. In the late 1500s Francis Drake planned a night attack on the city of Maracaibo, but had to abandon the siege because the lightning exposed his position. Ever since, the phenomenon has become a cultural icon. It’s embodied on the flag of the region, and Venezuelan fisherman use it as a lighthouse to guide them home after a night at sea. In 2010 an El Niño brought drought, and with it the lightning was snuffed out. The people feared that it would never return. If they could have done something they would have, but with no control of the lightning everyone just watched and waited. Under the sea, the Venezuelan coastline near the Catatumbo shares many species of coral with Curaçao, where the animals ring the entirety of the island. 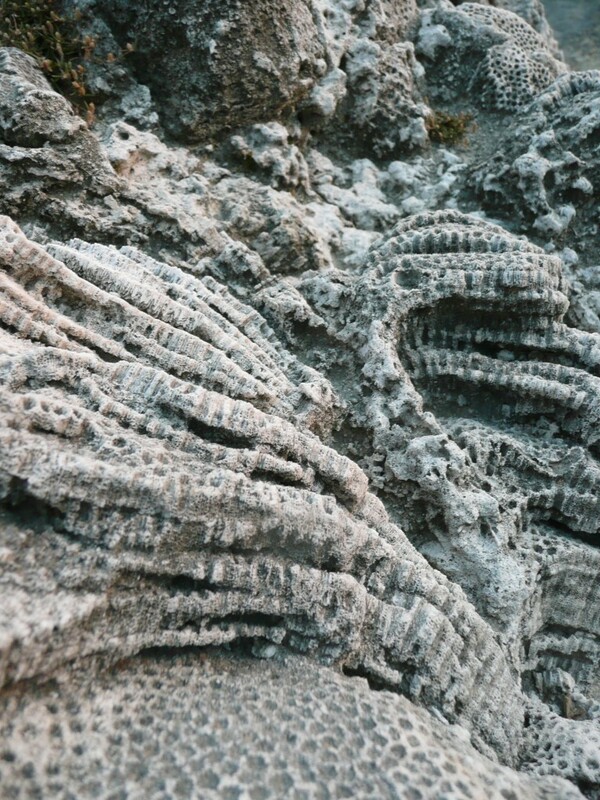 Ancient, long-dried coral reefs are even visible on Curaçao’s shores. What might appear as nothing more than a rocky cliff or outcropping in fact shows a clear biological pattern—thousands of small circles created by separate individuals of the colonial animal, stuck together by the hard skeleton they built around themselves. These ancient reefs now sit amidst the tinkering of humanity. Exposed reef crests and slopes are chopped, broken, or moved in order to make way for buildings. Hotels, rental condos, modest homes, and small stores dot most of Curaçao, interspersed with stumpy flora: woody shrubs, cactuses, small trees, and non-native palm trees. The human footprint is most evident in and around Willemstad, the island’s core and capital. Its streets are lined with buildings painted in the characteristic bright colors of the townhouses of Amsterdam: Curaçao is a jewel in Holland’s crown. The brilliant hues of orange, yellow, and red are found throughout the island, and the sunlight enhances their vibrancy, striking a contrast against the greens and blues of the tropical waters. The island of Curacao is built upon ancient reefs. Now contemporary reefs are threatened by human development. Photo by Kristen Marhaver. 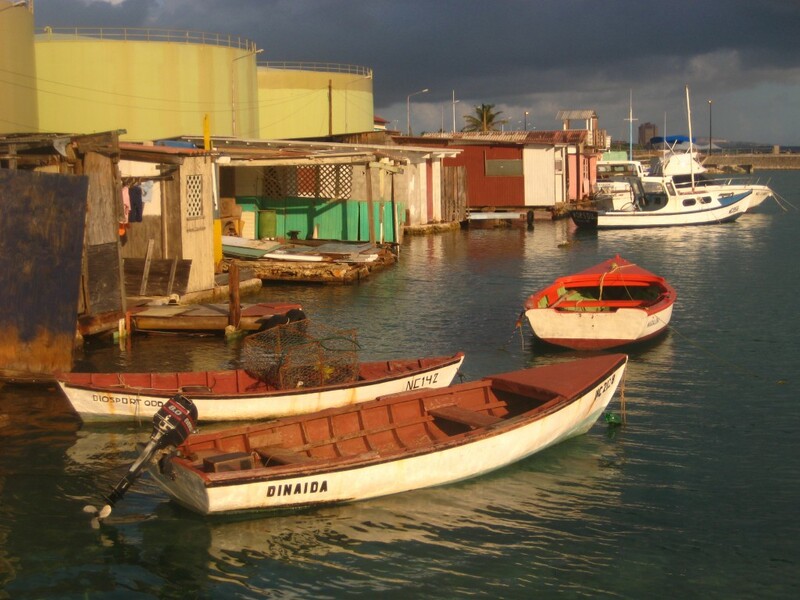 From Willemstad, hotels radiate to the east and west along the leeward coast, threatening to swallow up Oscar’s shack and many smaller communities along the sea. With development inevitably comes more resources: sand is trucked in to bolster artificial beaches; waste is generated by tourists; fertilizers are used to keep golf courses green. Much of it ends up in the sea, rinsed from the land during rainstorms or blown in by the wind, inevitably changing the makeup of the water and resetting the ecological rules for the organisms that live there. The trappings of tourism create animosity between island visitors and fishermen, especially those tourists who travel to Curaçao in search of SCUBA diving. As these recreational divers descend on the island’s reefs they occasionally find fishing gear indiscriminately harvesting fishes from the reef: small groupers, snappers, and a multitude of colorful and ornate species. 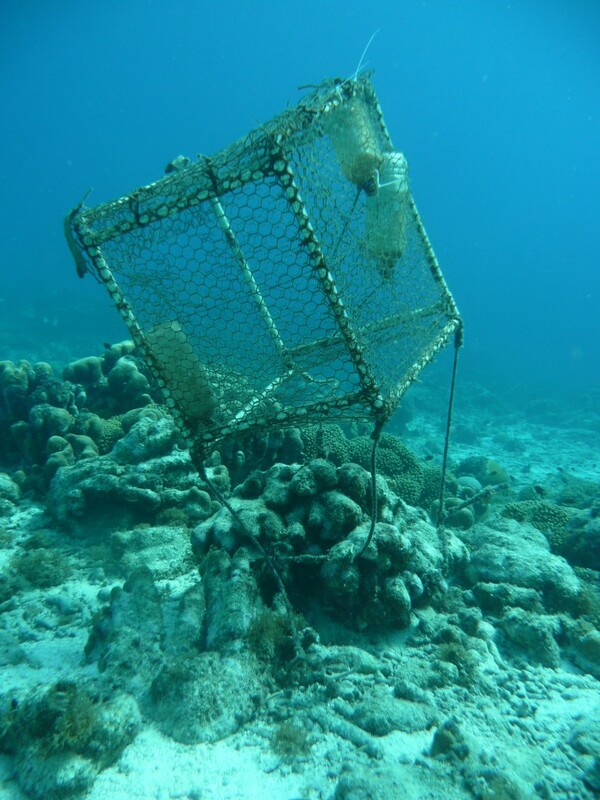 The divers often destroy the nets and traps with knives to release the fish; they feel they’re protecting the reefs. The tourists love a healthy reef and blame the fishermen for removing a beautiful piece of it. The fishermen blame the tourists for pollution that harms the fishes and corals. Meanwhile, both sides demonstrate two primary benefits of a healthy coral reef: a source of protein and a source of tourism dollars. While neither side is entirely misguided in their grievance against the other, one comes from a position of greater privilege. While some Curaçaoans fish for fun, many need food for their family. Poverty is commonplace. A colleague of mine, Ayana Johnson, interviewed fishermen all over the island and they told her that things are getting worse. There are fewer and fewer fish to catch, the fishermen said, and the ones they’re catching are getting smaller and smaller. Curaçaoan youths are turning away from fishing in hopes of making money elsewhere. Those who still fish — and are lucky enough to have a boat — set off toward the sea every morning, venturing far beyond their home reefs, heading offshore and targeting different types of fish in deeper waters. They press on as they always have, hoping to find a greater bounty. During his time on the H.M.S. Beagle, Charles Darwin noted the diversity of corals covering the seafloor around the tropical islands he visited in the Pacific. Had he looked closely, he would have seen that each individual in a colony has a ring of tentacles around a central mouth, tentacles that the coral uses to grab food that passes by: small animals, plants, or dead organic matter. But water-borne food is sparse in the tropics, and the corals are forced to get by with inadequate sustenance. Yet corals have figured out a way around this problem, and in so doing have formed one of the most prolific symbioses in nature. Nearly every individual coral contains single-celled algae, which make food via photosynthesis and release it to the coral host, their symbiotic partner. The coral consumes this offering and returns the resulting waste back to the algae as nutrients, allowing for even more photosynthesis. The tight internal recycling allows both partners to proliferate in an environment that doesn’t offer much. While the ability of corals to recycle the precious building blocks of photosynthesis allowed them to dominate nutrient-poor tropical waters of Darwin’s day, the vast ‘carpets’ of corals he wrote about have become rare in modern times. In nutrient-laden coastal areas, such as those created when fertilizer and sewage flow into the water, the animal’s advantage is lost. Large, plant-like algae — quite dissimilar in form and motive from the corals’ symbiotic partner — soak up the extra nutrients and grow rapidly, choking out neighboring coral colonies by smothering, whipping, or completely overgrowing them. The loss of fish compounds the issue. Many reef fish eat algae, cutting the corals’ competitors down like a lawnmower. With the algae beaten back, corals have more space to grow. But without fish, corals don’t stand a chance. Over time, coral reefs without fish become algal reefs, more graveyards than ecosystems. While local impacts like pollution and overfishing can be chronic, a more ominous cause of coral decline is the breakup of the coral-algal symbiosis. When seawater temperatures increase too dramatically, algal photosynthesis is thrown off, and the algae create chemicals that harm the coral host rather than nourish it. When the relationship turns destructive, corals have no choice but to kick out their algae. After losing its symbiotic partner, corals are left to live off stored fat and any food they can grab from the water. But this solution is temporary — for both to survive, the coral and algae must reunite. With the loss of the algae so goes the corals’ pigmentation, resulting in a whitewashed complexion called ‘bleaching’. While natural history accounts of coral date back to before Darwin’s time, today’s unprecedented warming has exposed corals to high temperatures more rapidly than ever before. Widespread bleaching events have led to the demise of entire reefs, sucking the life out of million-year-old ecosystems in a few short months. 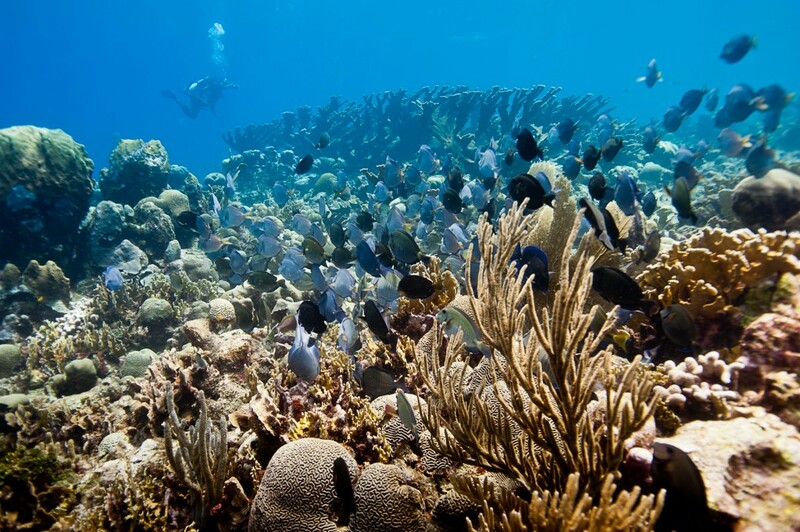 A number of Curaçaoan reefs recently bleached during a particularly warm spell. Some corals were lost, but in the end the reefs largely recovered. As marine biologists we were left to ponder: Why did some corals perish, why did some bleach and survive, and why did some not bleach at all? Part of the answer may lie in an emergent pattern. Which corals survive and which perish are closely tied to the state of their environment and the level of local impacts they feel. Just as couples are more likely to fight when they’re sleep-deprived and stressed about work, corals are worse at tolerating increases in temperature if they’re already battling other issues — the same local issues that local fishermen and tourists are fighting over. 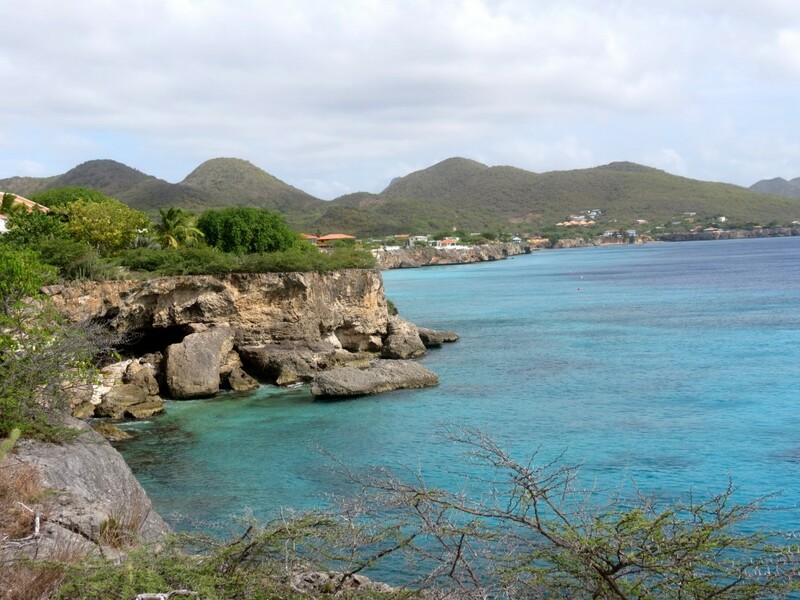 Thanks to coral bleaching, lush reefs like this one at Eastpoint, Curacao, are increasingly hard to find. Photo by Paul Selvaggio. Mark, Kristen, and I returned to the site near the water factory a year after I’d first met Oscar. After the widespread bleaching of the previous fall, we feared that beleaguered colonies wouldn’t be able to create the next generation. We were nervous. When we arrived, Oscar’s snack was open for business, and things were hopping. The chairs and tables that last year sat empty were filled with people socializing and drinking. A group of fishermen played cards around a table, laughing boisterously. A young woman with her hair up in curlers played dominoes with two young boys, while another sat with a toddler on her knee. An aging fisherman chatted with two women as they sipped beers wrapped in napkins. Oscar sat under the canopy of his porch, surveying the scene. “He’s professional,” the man sitting next to me proclaimed over loud music. “I just fish for fun, but Oscar, he’s professional.” Oscar smiled as we turn our attention to him, though he had no idea what we were speaking about. I shouted across to him, asking when he last went fishing. “Mi dushi!” Oscar exclaimed repeatedly in Papiamentu—my dear—trying to get her to come to him, though she was more interested in gnawing on the cap of an empty Coke bottle. He finally gave up, winked at me, and changed his chant to “ayo, ayo, ayo” as he waved both hands—goodbye, goodbye, goodbye. He shuffled out onto the concrete slab and began talking with a man whom I initially sized up as another old fisherman. “You’re an American?” Oscar’s companion asked me when I came to join the two men. “I am. How do you know Oscar?” I asked, smiling at my elderly friend to his right. “Oh, I’ve known Oscar a long, long time,” the man said. “But he’ll never take me fishing. I keep asking and he keeps saying no.” Oscar smiled and wandered back to his surveying perch. “What are the divers doing out there?” Oscar’s friend asked, once we were alone. The old man nodded his head in understanding. “So it only happens at night, then, the reproducing?” he asked. I nodded in confirmation. “Ahh, ok, ok,” the old man replied, looking towards the ocean. “Unbelievable thing we have done, harming nature like we have. It seems so big to us, how could we harm it? But we have, we have.” He shook his head in sadness, surprising me with his candor. Abandoned fish traps continue to catch fish long after their owners have departed. Photo by Kristen Marhaver. “True,” I responded quietly. A moment passed. “Have you lived here long?” I asked. “I grew up here on the island and then went to Holland for many, many years,” the man said. “I was a teacher there, but now I am back.” The old man began to hack, a cough from deep within his lungs, and I couldn’t help but wonder whether he had returned to his homeland to live out his remaining days. It would be fitting. The name Curaçao dates back to Portuguese seafarers, who called the island ‘Ilha da Curação’ or ‘Island of Healing’, because sailors with scurvy went there and were cured. “I grew up just the other side of the Avila Hotel, just down the road here. I loved it, loved the sea,” he told me after composing himself. “The sea is like air conditioning. It would get so hot during the day, but all you had to do was just go jump in the water and you would be cooled. When I was young I would swim all the way down to the sand and lie on my back, I’d put my hands above my head and think: forget you world.” He smiled and leaned forward — “forget you world,” he said again — now laughing aloud. “Did you fish when you were young?” I asked. “Yes, I did. We all did. I fished with a speargun then, when it was not yet illegal. But now…” The old man threw his hands up. “It is truly incredible how much we have taken out of the sea, incredible that we have such an impact. “And the corals won’t be there if all the fish are gone,” I replied before I could stop myself. Though the elder didn’t flinch or frown, I felt like I had said too much, like I had overstepped my place, and I changed the subject. A while later, when it came time for him to leave, we finally introduced ourselves. “My name is Yustus,” he said. “‘Useless Yustus,’ they call me.” I smiled, not knowing what to say. Oscar shut the snack down at ten that night. Mark and Kristen were still diving so I prepared to head back to the car to wait for them. “You, man, you can stay. Dey leave.” He gestured to the others, waving them away with his hands. Ten minutes later we leaned on the concrete railing of the porch, absorbing the sudden silence. Soon Mark and Kristen emerged from the ocean carrying the tents. Kristen carried a mesh bag that contained multiple closed tubes and I breathed a sigh of relief. Despite the bleaching, the corals had spawned. There would be a chance at a next generation this year. We reunited at the car and jumped into action, mixing the eggs and sperm in a bowl in the parking lot. While we worked I stole a few glances over my shoulder. I could see Oscar ambling around the porch to pick up the few beer cans that lay about, tossing them in a big trash barrel. On my last glance I caught sight of him staring in our direction, so I waved, but he didn’t seem to see me. Moments later he shut off his fluorescent lights and his shack went dark. Back at the field station, Mark, Kristen and I worked through the night to keep hundreds of thousands of baby corals alive. In the ensuing weeks, our experiments showed us that the next generation is tougher than it appears, even when faced with changes to their environment. Out on the reef, certain young adult corals are surviving in strange surroundings as well: the ultra warm waters that flow out of the water factory, as well as reefs that are algae-covered, at the mouth of harbors, or offshore from some of the dirtiest beaches in town. We are left to wonder: Are some corals capable of accepting a new normal? Most marine biologists agree that the future is quite dire for corals. These animals have lived with gradual environmental change for millions of years.Today it’s the animals’ capacity to cope with rapid change that will determine their future. The signs we see on the reefs of Curaçao give me a glimmer of hope. I’m left to wonder whether the next generations will be the key, perhaps holding greater capacity to live in an environment unlike their parents’. I refuse to spend my career refining nature’s obituary. My baseline for a healthy coral reef has been set only over the most recent decade. Gathering anecdotes and reading scientific literature has been my only means to piece together images of the truly pristine reefs of the past. Yustus’ sense of the loss of reefs was more acute than Oscar’s — perhaps leaving the island for many years and then returning illustrated the extent of decline since his childhood. Yustus’ baseline still resonated in his mind, but Oscar didn’t see things the same way. Perhaps for him the changes were too gradual to be recognized, or perhaps he had just learned to accept that things will go away and we will not always know why. All we can do is hope that they return once again. Later that year the drought in Venezuela ended. As the rains came down the lightning returned and the coastal Venezuelans rejoiced. Their light was back, bright and unharnessed, blinking stochastically in the night sky above the mouth of the Catatumbo. The land meets the sea on the leeward coast of Curacao. Photo by Caroline Dubé. Aaron Hartmann is a Ph.D. student at Scripps Institution of Oceanography in San Diego. Originally from Vermont, his research has taken him to Curaçao and Hawaii to study coral reefs. Aaron writes the blog Science Minded, which aims to demystify antiquated views of careers in science. Beautiful story, Aaron. You really captured the fragility of the human relationship with this ecosystem. Aaron, great mix of natural history, life sciences, and cultural experience. A good description of Nature at its best, and how we -as humans, can unfortunately easily affect the natural balance around us… Looking forward to your next blog. You should mention the huge amounts of pesticides they use to control the red palm weevil.